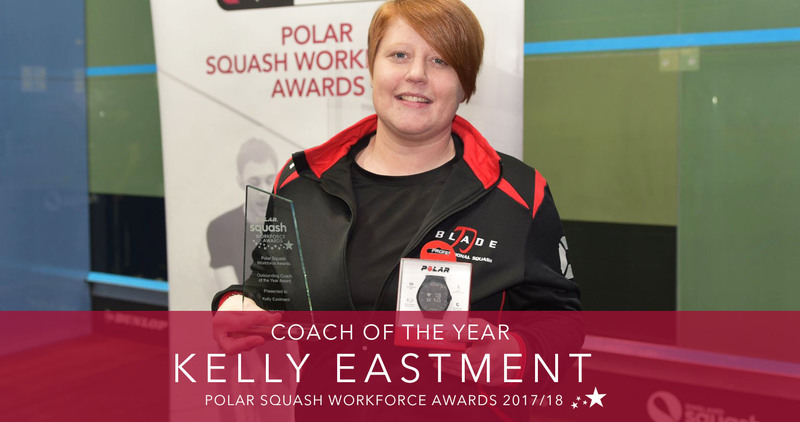 West Worthing club coach Kelly Eastment has been named as England Squash’s Coach of the Year for her tireless dedication to grassroots squash. The Polar Squash Workforce Awards, which were hosted at the 2018 Dunlop British National Championships, recognise and celebrate those who have made an outstanding commitment and contribution to the sport. The awards panel came to their decision after hearing how Kelly had transformed the fortunes of West Worthing Squash Club through her continuous effort to the junior and senior game. Originally from Westergate, Chichester, Kelly has a long-established background in squash, playing nationally until the age of 17 and coaching since the age of 16, achieving her level three coaching award before the age of 20 and coaching the British Juniors at the Olympic stadium. Eighteen months ago, Kelly took up the role as club coach at West Worthing Squash Club, where she has set about a transformation of the organisation, bringing a spark back to the centre. “I was very emotional when I heard that I had won it. “I feel very touched and privileged to be able to have won the award." Kelly has established a number of training platforms, including drill nights, fitness classes, drop-in sessions as well as running half-term and summer camps for juniors. Her dedication to the younger generation has helped to increase junior participation figures in the West Sussex area through her partnerships with local schools and colleges, in addition to working with children with learning difficulties. Her overriding passion for squash led to Kelly establishing a number of hugely successful squash tournaments, increasing the number events to four per annum including three 57 leagues and attracting pairs from as far away as Wolverhampton. Her friendly and approachable style of coaching goes beyond the call of duty, spending her spare time travelling with her teams when they play in the Sussex league as well as organising a tour to Kent for the juniors later this year. Daniel Stuart, who nominated Kelly for this award, said: “Kelly is able to make everyone from school children, girls and women as well as those who are latecomers to the sport feel most welcome at the club. “This also helps with coaching and keeping younger teenagers encouraged and involved.